One of my readers requested a new recipe based on my “Taco Meat” from my Amazing Cauliflower Tacos Recipe. So I took a break from the Instant Pot last night and whipped up what I call this Vegan Taco Pie. And it was mighty delicious! Spiced Cauliflower crumbles, mixed with sautéed Onions, Bell Peppers, and a homemade Enchilada Sauce, topped with my Vegan Country Cornbread. The guys are really going to like this one! This is actually a very simple recipe based on several of my previous recipes. The Enchilada Sauce can me made from my Potato Mushroom Enchilada Recipe. The taco ‘meat’ is from my Amazing Cauliflower Taco Recipe. And the Cornbread Topping is my Country Vegan Cornbread Recipe. I bought one of those bags of Riced Cauliflower already precut and it made the Tacos come together a lot easier. Start your taco meat baking while you prepare the Enchilada Sauce, which is nothing more than Tomato Sauce, Water, and some spices. Then, sauté a large Onion, 1 Green Bell Pepper, and 1 Red Bell Pepper in a little bit of Veg Broth. When softened, stir in 4-5 cloves of minced garlic and let then simmer for a minute or two. Stir in your baked Taco Crumbles and 1 cup of Enchilada Sauce. To give it even more of an authentic Taco/Mexican flavor – stir in 1 Tbs of Masa Corn Flour and it will also thicken the filling. Spoon the filling into a 9×13 Glass Baking Dish and then pour the batter from the Cornbread Recipe over the top. Bake in a 350 °F oven for 30 minutes…or until the top has turned a golden brown. Garnish with shredded lettuce, tomato, salsa, or avocado. The sweet cornbread goes very well with the slightly spice taco mixture. I can easily see this becoming a new regular on our dinner rotation. Please give me a shout if you try it and let me know what you think! As always – keep those comments coming. Spiced Cauliflower crumbles, sautéed Onions, Bell Peppers, and a homemade Enchilada Sauce, topped with my Vegan Country Cornbread. Vegan Taco Pie! Mix all Enchilada Sauce ingredients in a small saucepan and heat until bubbly. Slowly stir in cold water. When simmering again, add cornstarch slurry to thicken. Set aside 1 cup of Enchilada Sauce. Prepare Taco Crumbles by chopping mushrooms and walnuts until uniform in size. The crumbles should have the size of crumbled hamburger, or rice. Add Cauliflower and stir to combine. Add all Taco Seasonings and stir to coat. Stir crumbles around and then bake for an additional 15 minutes. Saute veggies (onion & Peppers) until softened. Stir in minced garlic for a minute or two and then stir in Taco Crumbles. Add the cup of Enchilada Sauce and stir to combine. Stir in 1 Tbs of Masa Corn Flour to thicken if desired. Cook until bubbly and slight thickened, and then remove from heat. Spoon mixture into a 9x13 Glass Baking dish and spread evenly. Prepare Cornbread Batter by mixing all dry ingredients first. Then mix all wet ingredients together and pour into the dry. Mix until a loose batter has formed then pour onto casserole - spreading evenly. Bake in 350 degree oven for 30 minutes or until golden brown. How would these even be too salty? He barely uses any salt and those other spices are just spices with no salt. Are you SOS free? Chuck, I’ve been using your taco ‘meat’ recipe in chili and taco salad. They make my 3-bean chili have that ‘meatier’ texture. What an awesome recipe. To the reviewer who threw out what she made…that is such a waste. So many hungry people out there…I would never throw away food. You could have used it in chili and other things. Just saying. This is really delicious, thank you. Love the sweetness of the crust paired with the spicy meat mixture. I added pinto beans to make it a bit more filling. I’m puzzled about the 15 min prep time though. I’m a pretty good cook but it took me far more than 15 min to make the cauliflower rice, do all this chopping, sauce making, mixing together, and putting together the batter. Was that a mistake or do I need to work on my skills? I’m with you, Sally. This meal took a LONG time for me to prepare – but the results were so delicious that I know I will want to make it again. Next time I will do all the veggie prep the day before. Then I can make the enchilada sauce while the “meat” is baking and saute the onion/pepper mixture. I was a little confused about the water and cornstarch in the enchilada sauce. A slurry was mentioned, but made with th cornstarch and … what? some of the water? How much. Anyway, I forged ahead, loved the sauce, and went ahead and used it ALL in the recipe since I didn’t have any upcoming use for it. Made a great texture. The recipe is a keeper, but definitely had miscalculated the time necessary to make it. cooking is hard for me. this recipe, while simple, took hours! i really pushed to mix the cornbread top and get it on the dish all at one time, ’cause i was getting mighty hungry…and as i stepped back and closed the oven door…i noticed the saucepan of enchilada sauce on top of the stove. crimany, that should have gone in before the cornbread top!!! well, i poured the sauce around the edges of the casserole, and drizzled some on top, knowing deep in my heart that i ruined this dish. did not expect anything edible to come out of the oven, but to my surprise…FOOL PROOF RECIPE!!! Can the taco crumbles be made and then frozen for later use? Yes, I’ve frozen it many times. I’ve also frozen the cauliflower and mushrooms after I processed them to have on hand to save time for a future batch. Do you include nutritional values in your recipes? I usually use the amazing cauliflower taco meat recipe on Tuesdays for our Taco Tuesday. My husband and I love it so much that I have recently started making a double batch. I was wondering what to do with it when I came across this taco pie recipe. It was very quick and easy to make since I’ve already made the meat meat crumbles. This was very tasty, my husband is still telling me how amazing supper was and we ate 2 hours ago! We’ve been eating mostly plant-based for almost 3 years, and after his second serving of Taco pie, my husband told me this was the best plant based meal I’ve ever made. 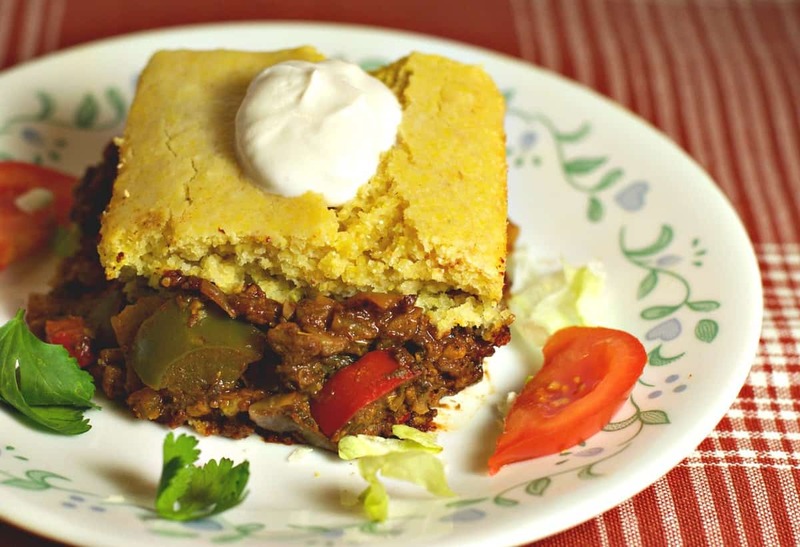 The flavors were spot-on, the spice combined with the sweetness of the cornbread were great! Like I told my husband, the only complaint is that it had a bit too much flavor for our toddler so I had to make him something different, but that means more for us! I’m getting ready to make this and noticing that the cornbread topping is missing the can of creamed corn that you use in your cornbread recipe? Is that correct? I’m a little confused. The recipe says to set aside one cup of enchilada sauce. One cup of sauce is added to the sauteed peppers and onions and crumbles. What do I do with the other cup of enchilada sauce? Save it for another use. Cindy, I added all the enchilada sauce (almost two cups). It was GREAT! Fantastic!!! I didn’t change a thing! I had made the taco crumbles before, but the enchilada sauce and corn topping recipes were new to me. Everything combined was so delicious. Thank you so much for your wonderful recipes! This taco pie is one of our family favorites. It is one of those recipes that is just as good, or even better, the next day. It is less time consuming if you have the taco crumbles made ahead of time. I triple the batch and freeze the crumbles so that I can just pull them out of the freezer. The enchilada sauce is very versatile and can be used in many other recipes.